I’m still in Turkey-coma. 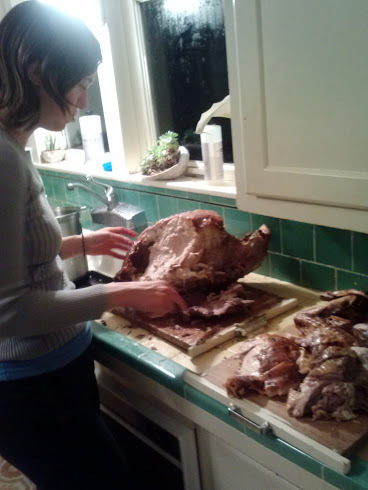 There are gallons of soup to be made, meat to slice and freeze, (we only carved one side of the bird and still fed six people and loaded Sarah up with meat to take to Ukiah!) and a fleet of glass tupperware full of side dishes and drippings in the fridge. It’s epic, in other words. I left off yesterday with the bird in the oven and The Kid returning from her job to the house. Once she got home we sat in the kitchen and talked for a while, then steamed potatoes to make mashed potatoes later, chopped veggies to steam in apple juice, and made a salad. All the produce grown by me and harvested the same day, potatoes grown by John. 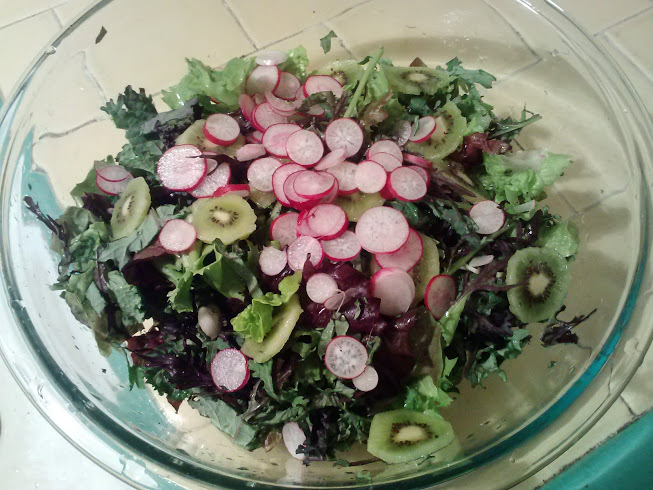 Kiwis and radishes are amazing in salads, I promise. The kid mashed potatoes, and her boyfriend stopped by. I had run into one of my amazing garden volunteers in the store earlier when I was hunting down a roasting pan big enough for Mr. Tom. She was leaving in a week to be an intern on a farm up north, and I suggested she stop by. 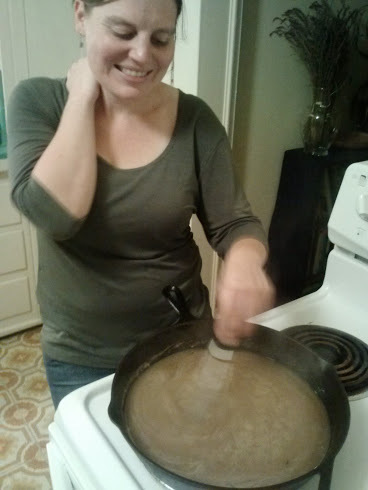 She did, and brought local wine, and whisked gravy like a pro. Felicia, you are a trooper and a joy wherever you happen to be, and the farm is lucky to have you! Gravy is serious business in my family. Serious, serious business. I think we did my mom proud on this one. 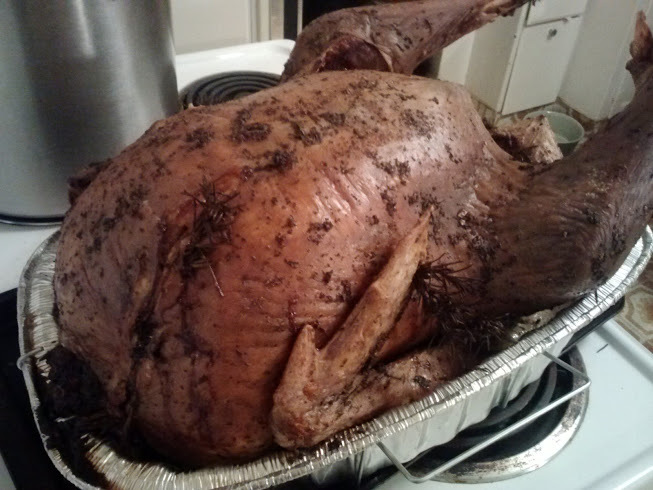 I’m getting a bit ahead of myself though- before we could make gravy we had to get the bird out of the oven. We don’t have pictures of this process, because we were focusing all our energy on trying not to die. We ended up doing an odd, double pan thing, because the largest “Eco-pan” roasting pan Harvest stocks didn’t quite hold the bird, and even without adding any liquid the juices were clearly more than what the poor roasting pan could handle. We layered it with a large baking pan. The bird was hugely heavy. The Kid and I ended up each having to lift a side of the pan from the bottom. This resulted in some spilled juices and multiple superficial burns. We eventually got the thing onto the stove top only to find that the roasting pan was twisting under the weight and threatening to spill juices everywhere. Felicia saved us and stuck our cast iron underneath and I managed to hold it up and pour off the liquid. 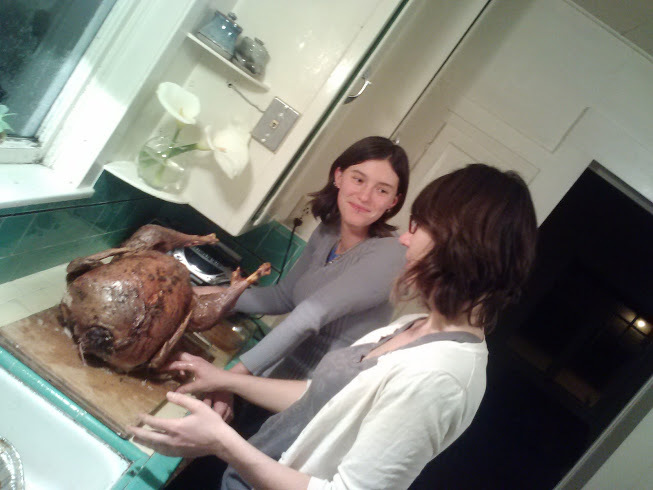 We had the bird out of the oven. Transferring it to the cutting board on the counter was another two-person job- Sarah and I bent the front of the pan into a kind of ramp, placed the cutting board in the lower level of the sink, and basically skated the turkey into place, then lifted the cutting board back onto the counter. 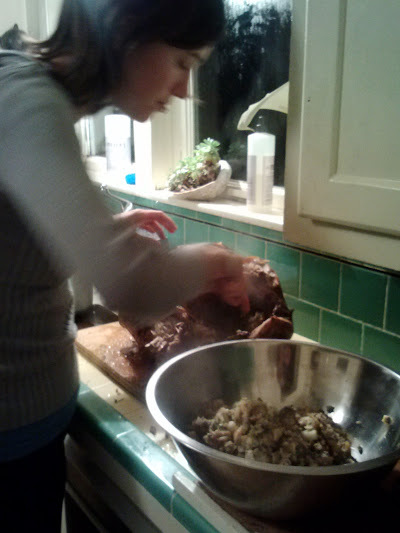 Scooping out the stuffing was one of the singular best things I have ever done. I felt like a Viking Queen. 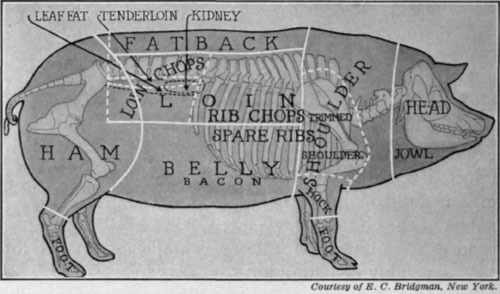 This massive beast was laid out in all its unknowable, divine, infinite glory. I almost never eat meat, I was vegan for several years, and never ate commercially raised meat really ever. I rarely crave it and don’t miss it when I do without it. 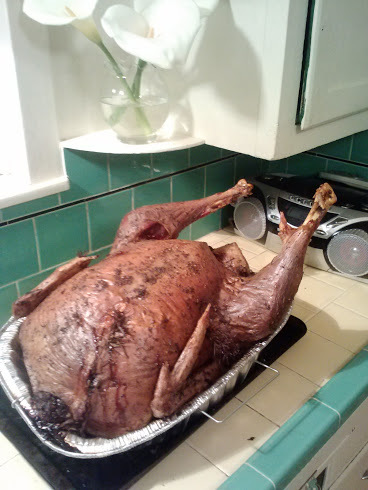 But this turkey made every single cell in my body vibrate. With my tiny paring knife, since I don’t even own a carving knife, I sawed off huge moist chunks. 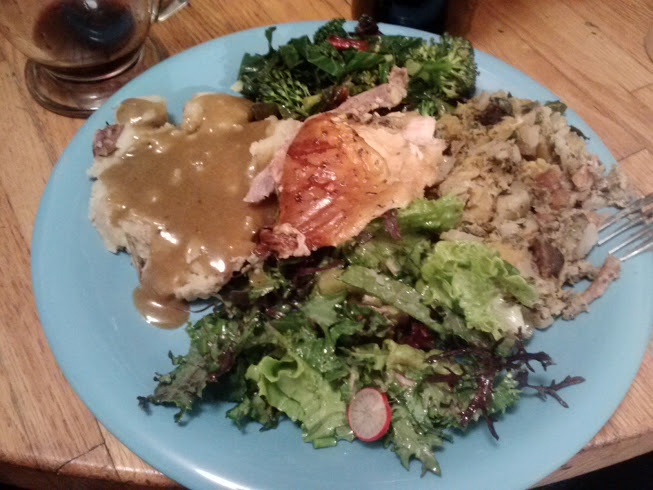 With perfect timing, my poor mostly vegan boyfriend walked in from his EMT class to find a kitchen full of people and an immense turkey splayed out on every surface. 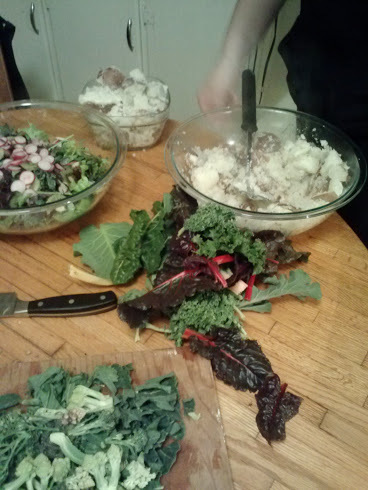 Being a total champion, he took it all in stride and accepted the potatoes and greens that we refrained from dumping turkey fat on for his sake. I, on the other hand, dumped turkey fat on everything.